Housing, Transportation, Health, Wellbeing, Nutrition, Legislation. Whatever the issue is, if it impacts older adults, the Commission on Aging advocates and educates on your behalf. The Commission will field and follow up on concerns of older adults and is accessible to all Marin County residents. Questions about community resources? We have a team dedicated to helping you navigate local services and will provide answers on the phone, in-person, or online. Call 457-INFO or visit www.marinhhs.org/aging to find options that meet your needs. Whether it’s protecting older adults from abuse, or coordinating home delivered meals, we provide a range of community based services to older adults to enhance quality of life and to provide a safety net. We are actively planning for the future to ensure that Marin is an age-friendly community for all. Marin County Aging and Adult Services takes action provides answers advocates to help older adults live long and live well. Since 1977, we have been dedicated to providing services and planning for the needs of older adults. We help Medi-Cal eligible individuals with disabilities maintain their independence. We find community resources for you. 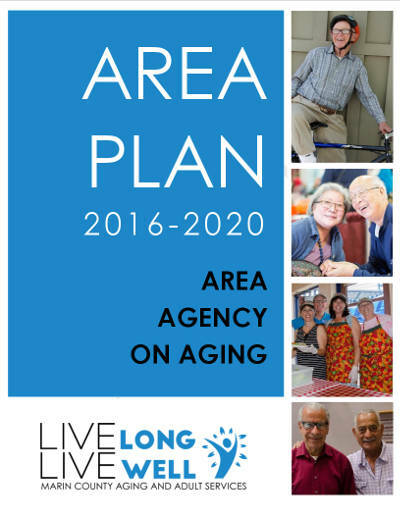 We actively plan for all Marin residents over 60, regardless of income. We act upon allegations of neglect or abuse (physical or financial). We speak up for the rights of residents of nursing homes and assisted living communities. We supply food to those that need the supplementary nutrition. Try Marin’s NEW online Community Resource Guide. The Marin County Commission on Aging is a 23-member federally mandated advisory council to the Marin County Board of Supervisors. The Commission works closely with the Aging and Adult Services on behalf of Marin’s older adults. Commissioners are appointed to three-year terms by either the Board of Supervisors or the 11 incorporated Cities and Towns in Marin. In addition, Marin County's Senior Assembly Member and Senior Senator, representatives of the California Senior Legislature (CSL) also serve as ex-officio members for a four-year term.